I found this address for the money 0x20832950 0x0098967F. Anyone got any pointers on how to update the other ones? The one I found was using cheat engine. But yes, that is it. The first part is the problem, the value probably shifted. So... there's not a Max money code yet? If you read the readme that came with the patch, you'll find that the hack authors' explicitly says that save from the Japanese (non patched) iso will not work with the English patched iso. Hence why cwcheat codes for the game needs to be updated. I mean, I've had success with using Cheat Engine externally but because of the nature of my lack of knowledge about Cheat Engine the mods don't stick and I don't know the conversion process for addresses. Hey dudes, this is the Money code!. Raybol found it and it works!. I've been testing cheats in ppsspp and you can load the Japanese version apply the old cheats then load the save in the translated version and it will work. Applying the patch seems to have moved the address of the old cheats by a fixed amount. I updated these ones last night and were working for me on ppsspp and my vita. Oooh, it's finally happened?! Thanks for all the hard work team. Looking forward to trying it as soon as I get time. Meh, who needs infinite money if you got these codes activated, with all of these activated, you're virtually unstoppable in-game at all times. Tested it using PPSSPP version 1.01 and they all work flawlessly. My Youtube Channel where I demonstrate my mad video gaming skills. Kekekek! Guys what does the "All weapon pilot" code do? Really fun game so far. The music... How does SRT always have such a great soundtrack. Translation's "AAA" top-notch. It's amazing. I can't bring myself to rename the MC and the mechs though. Having faced them in OG2 and OGG Axel-Soulgain and Lamia-Angelg have become far too iconic in my mind to apply my form of role-playing to it. 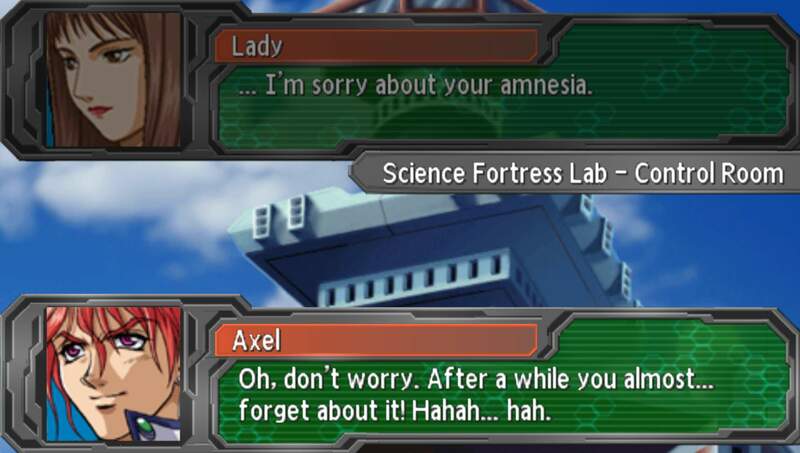 It is refreshing to see a nice and funny version of Axel though, as opposed to the angry numbskull he was in OG2.